Thanks to an historic gift to the University of Toronto from Gerald Schwartz and Heather Reisman, the soon-to-be built Schwartz Reisman Innovation Centre will accelerate innovation in Toronto and Canada by creating the country’s largest university-based innovation node. The $100-million investment is the largest donation in U of T’s history and the largest gift ever to the Canadian innovation sector. The gift will help construct a 750,000-square-foot complex designed to anchor U of T’s unique cluster of world-leading artificial intelligence scientists and biomedical experts, its world-class entrepreneurship network, and the country’s largest concentration of student- and faculty-led startups. The gift will also support the launch of the newly conceived Schwartz Reisman Institute for Technology and Society, whose mission will be to explore and address the ethical and societal implications of AI and other emerging technologies. The Institute will facilitate cross-disciplinary research and collaboration and will draw on U of T’s signature strengths in the sciences, humanities and social sciences to explore the benefits and challenges that AI, biotechnology, and other technological advances present for our economy, our society and our day-to-day lives. 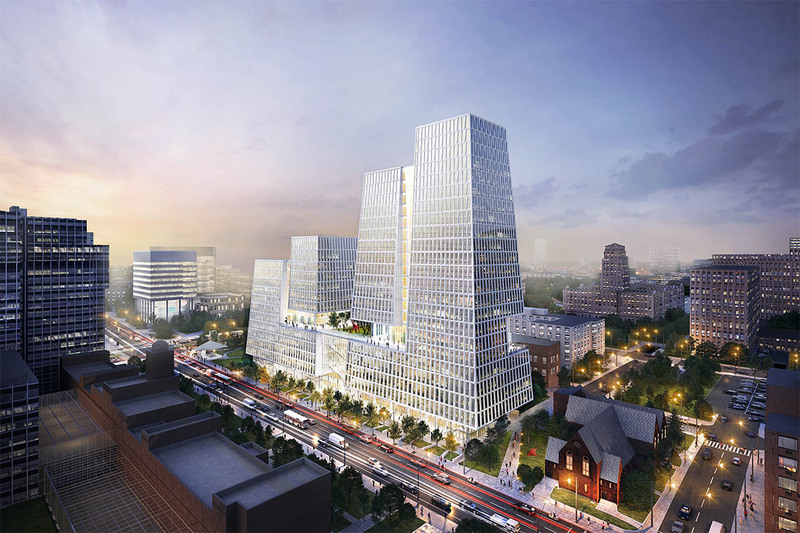 The Schwartz Reisman Innovation Centre will occupy one of Toronto’s most iconic locations, the northeast corner of College and Queen’s Park. Designed by WEISS/MANFREDI, the Centre will be a showcase for “innovation architecture.” The Centre’s layout will feature vertical gardens, soaring atria and collaborative spaces and will promote intellectual exchange and invite the public to take part in events and interact with scholars and innovators. 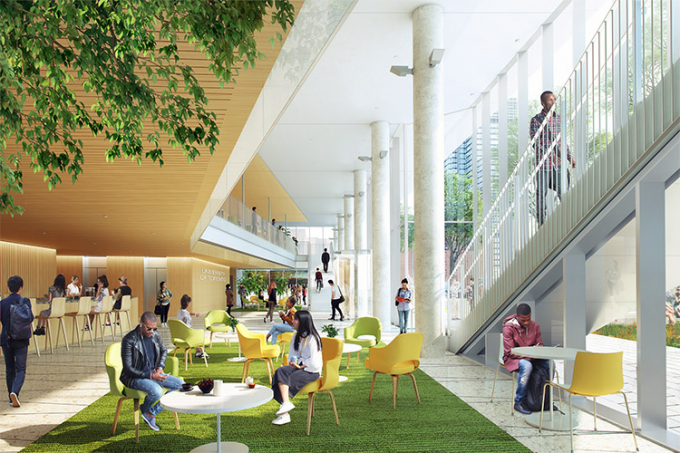 U of T expects the building’s engaging spaces to host thousands of researchers, investors, industry partners and international visitors annually. In addition to opening up the university to the city, the centre will stimulate economic growth by capitalizing on U of T’s research and innovation prowess and providing space for smaller Canadian companies to grow. The Centre will be constructed in two phases. The first phase will be a 250,000-square-foot, 12-storey tower, while the second phase will be a 500,000-square-foot, 20-storey tower. The first tower will house, among other initiatives, the Vector Institute for Artificial Intelligence, a world leader in deep learning and machine learning research. It will also house the newly conceived Schwartz Reisman Institute for Technology and Society. 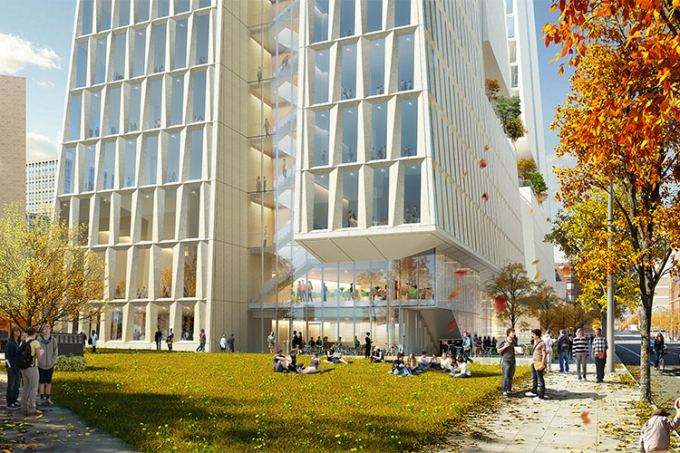 The second tower will house laboratories for some of the world’s top researchers and innovators in regenerative medicine, genetics and precision medicine. These scientists are investigating the promise of stem cells to repair and regenerate damaged tissues and organs, as well as treat cancer, diabetes, stroke and blindness. This tower will also house programs and organizations devoted to successfully translating these medical innovations into therapies and applications that will improve the lives of people all over the world, positioning Canada as a global leader in the health-care field. 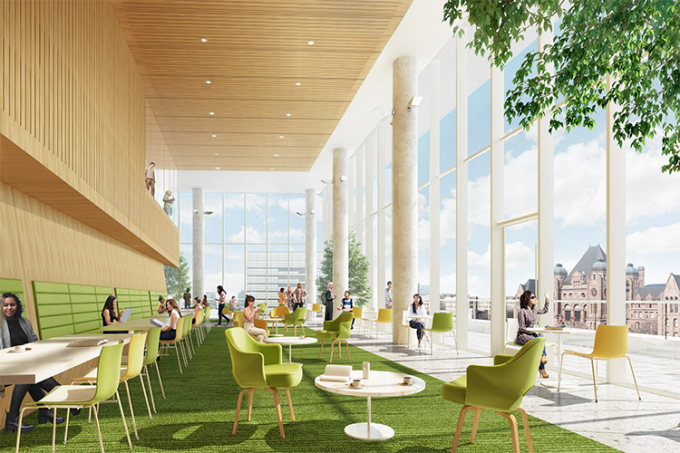 Both towers will provide much-needed space for startups and fast-growing companies, as well as various components of U of T’s innovation and entrepreneurship network. strengths in philosophy, ethics, law, social sciences, medicine, biomedical engineering, artificial intelligence, advanced materials, cybersecurity, fintech, cleantech and many other fields, U of T is one of the few institutions worldwide with the requisite breadth and depth to study the immense implications of modern technology, as well as how society shapes technological advances and how those technologies shape society. The university will appoint a director to lead the Institute. The director will hold the Schwartz Reisman Chair in Technology and Society and lead the development of programming and research initiatives. New fellowships and a research fund will help attract top minds to the Institute and encourage interdisciplinary collaboration. The Schwartz Reisman Institute for Technology and Society will also mount a steady calendar of activities – including a major international conference, high-profile speaker events and various workshops and seminars – to share its knowledge and insights with academia, industry, entrepreneurs, policymakers and the broader public. The University of Toronto is Canada’s leading university and consistently ranked among the top universities worldwide. U of T is also recognized as a leading engine for innovation and entrepreneurship. The U of T community of entrepreneurs has created more than 500 companies, and the university’s innovation network is among the world’s top five university-based incubators. The university also ranks in the top three for research output along with Harvard and Stanford universities. World-class strengths in fields such as biomedicine, computer science, law and philosophy make U of T the ideal place to study the effects of technology and society on one another. “The Schwartz Reisman Innovation Centre will help U of T faculty and student entrepreneurs reimagine industries and contribute to Canada’s social and economic success,” says Vivek Goel, vice-president of research and innovation.